Figure 18.5. A rapid decrease in λ sFLCs gives an earlier indication of response than intact immunoglobulin measurements in a patient with IgGλ IIMM. VDD: Velcade, doxorubicin and dexamethasone. Figure 18.6. Changes in the κ/λ sFLC ratio during 6 cycles of bortezomib (V) showing rapid responses to treatment and subsequent relapses. Figure 18.7. Accuracy of different blood tests for assessing bone marrow plasma cell volume in MM. Because of slow catabolism, IgG concentrations lag behind reductions in bone marrow plasma cell content during treatment. Early sFLC responses to chemotherapy have been reported by many researchers . Such responses are most apparent in IIMM patients treated with drugs that produce a rapid tumour response, such as bortezomib (Velcade). As an example, IgGλ and λ FLC levels for a patient with IgGλ MM are shown in Figure 18.5 . 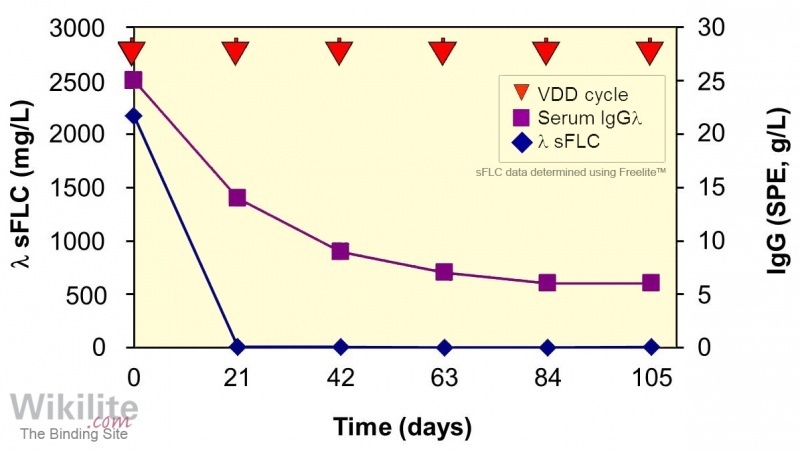 During initial therapy with bortezomib, doxorubicin and dexamethasone (VDD), the serum λ FLC concentration fell rapidly, and had normalised by 21 days following treatment. 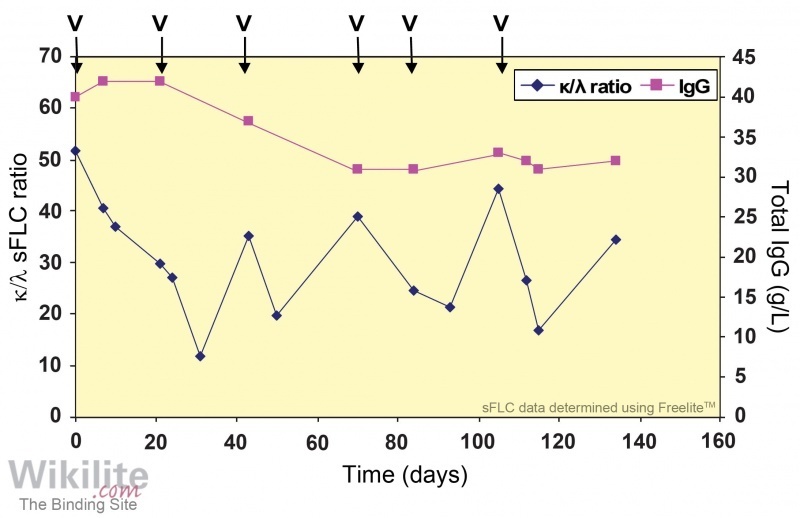 In contrast, IgGλ only gradually decreased (with a serum half-life of around 30 days), and treatment was continued. Measurement of sFLCs at short time intervals can provide additional information on the kinetics of response to treatment. For example, Das et al. reported rapid responses to bortezomib in 6 of 8 patients, 3 of whom exhibited repeated falls and rises of sFLCs co-incident with treatment cycles (Figure 18.6). The sFLC relapse was very rapid, with doubling times of less than 10 days. 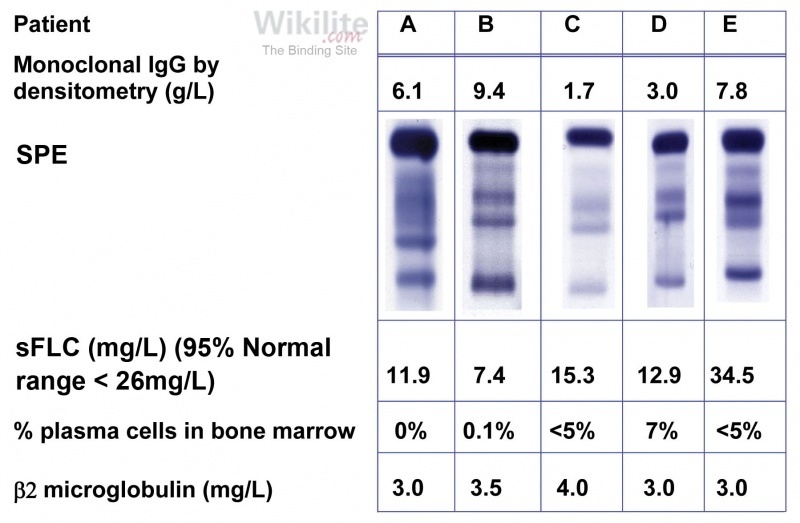 By comparison, the intact monoclonal immunoglobulin did not show the same peaks and troughs. Similar observations have been made in other studies using bortezomib . These rapid patterns of response can only be observed with the use of tumour markers - such as sFLCs - that are quickly cleared from the serum, together with short sampling intervals. Early indication of tumour responses by sFLCs could facilitate changes of treatment strategy, which may have a major bearing on cost of treatment and utilisation of resources . The validity of sFLC measurements as a marker of tumour response has been illustrated by comparison with bone marrow plasma cell counts. In a study comprising 45 IgG MM patients, Mead et al. showed that, during treatment, monoclonal plasma cell counts correlated better with changes in sFLCs (and serum β2-microglobulin) than they did with intact monoclonal IgG (Figure 18.7). κ/λ sFLC ratios had the highest concordance with bone marrow plasma cell counts, and were more accurate than both urine FLCs and SPE/sIFE for assessing disease status (Table 18.1). classified as abnormal if there were ≥5% plasma cells. Table 18.1. Comparison of bone marrow plasma cell counts in MM using different tests for monoclonal proteins .